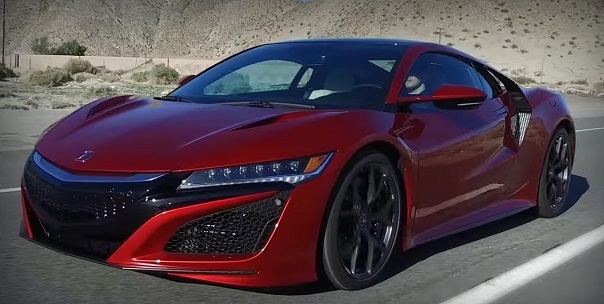 On the eve of the release in 2016 NSX, Acura announced a number of technical details of the model. It happened in Detroit, at the World Congress of the Society of Automotive Engineers. So, among other things, the manufacturer announced that the new NSX will be the first model of the Acura, equipped multikompozitnym frame, which includes a high-strength steel and aluminum. This ensures NSX lightness and strength simultaneously. Also, during the creation of Acura NSC has been applied, the so-called system of «ablation», which allows the use of ultra-strong cast in the zones of deformation in a collision. As expected, under the hood NSX mounted bi-turbo engine V6. To improve engine performance and efficiency of the model is equipped with a number of hybrid components. Super car also boasts the most advanced all-wheel drive system, which is able to distribute more torque than any other system in the brand’s arsenal. NSX 10 is equipped with heat exchangers, air-cooled to prevent overheating of the power unit, and also available V6 three radiator. The lateral air intakes are fitted with double coolers, for the most efficient cooling system. The new generation NSX was first presented in January at the show in Detroit, and mass production will start this fall in Ohio.